The Caramany from Calmel & Joseph organic wine has a deep fruity aroma and lovely ripe concentrated fruit palate. 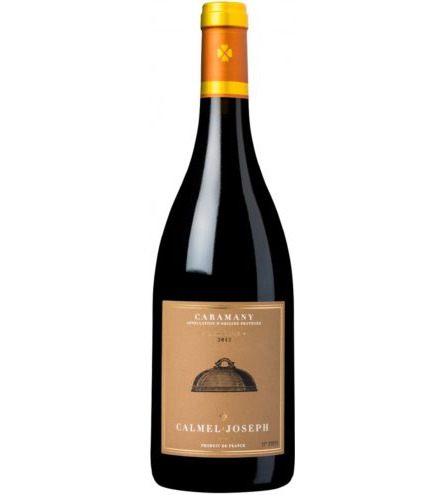 The grapes for the Calmel & Joseph Caramany are grown on steep hillsides at 400 m above sea level assisting with freshness and complexity in the taste and aroma of the wine. It is made from 30% Carignan, 40% Syrah and 30% Grenache. The Carignan undergoes carbonic maceration to extract as much fruit as possible whereas the Syrah & Grenache are fermented traditionally in tanks. The blend produces an open fruity wine with notes of cherries and mocha on the nose and a fresh elegant finish in the mouth. Founded in 1995, Calmel & Joseph is a maison de négoce specializing in Languedoc-Roussillon wines from private wineries from across the region. Over the years, they have built close personal relationships with a large number of growers from all appellations. Convinced of the extraordinary potential of this region, oenologist, Laurent Calmel, and Jerome Joseph work together on the vinification, blending and ageing of wines with the common purpose of demonstrating the little known yet unique quality of these Mediterranean terroirs. Free of all certification labels, our viticultural and vinification practices are natural and environmentally friendly. The Joseph & Calmel range comes from a rigorous selection of vineyards, with a particular focus on very cool terroirs (often on the very edge of wine growing areas). The grapes are picked (by hand) when they are perfectly ripe. We prefer gentle vinification rather than aggressive extraction. Careful blending harmonizes the balances of the local varieties. Our wines are patiently and naturally aged until they undergo gentle bottling which preserves the original balances and aromas. These wines are analyzed by an independent laboratory to detect active agents: full analyses of the wines are available on this website. At Calmel & Joseph, they are committed to the concept of freshness, finesse and elegance in our wines. Being located in a Mediterranean and therefore hot region, they look for terroirs which are as cool as possible, often found at the edge of wine growing areas in the mountain foothills. Once we have decided on the terroir, they look for vineyard plots which are worked as naturally as possible, because they believe that it is from these vineyards that wines with the greatest complexity, but above all the strongest personality, are produced. Once their criteria are met, they meet the wine grower and offer him/her a partnership on the selected plots. This wine is great with full flavoured meat dishes including duck and beef.